Genocide survivors have to manage a changing identity once they migrate to a new country. New identities become open to them in terms of new nationalities and becoming viewed as a survivor or a victim. This chapter explores how survivors manage this identity adaptation over time, and how they come to see themselves as a survivor, particularly analysing the concept of a hierarchy of survivors. The notion of being a survivor is one which has seen much discussion, and this chapter explores the nuances of the terms ‘survivor’ and ‘victim’. 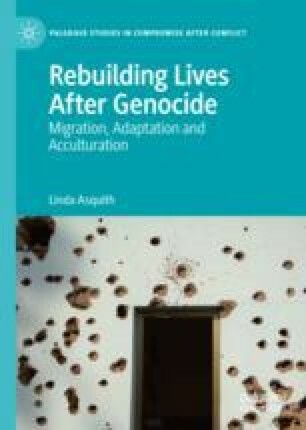 In addition, this chapter also explores the idea that genocide survivors constitute a field (in the Bourdieuian sense) in themselves, discussing how this field functions and impacts upon survivors. In doing so, this chapter examines which individuals become dominant and achieve a higher status in the survivor field. In closing, the chapter considers how survivors talk about their experiences and how memory, both individual and cultural, affects the retelling of stories. Britain’s Holocaust Survivors. (2013). Directed by Daisy Asquith. London; Channel 4 27th January, 9pm 2013. Retrieved from https://vimeo.com/106264980. Kimmelman, M. (2011). Auschwitz Shifts from Memorialising to Teaching. New York Times [Online]. Retrieved December 27, 2018, from http://www.nytimes.com/2011/02/19/arts/19auschwitz.html?pagewanted=all&_r=0. Klocker, N., & Dunn, K. (2003, November). Who’s Driving the Asylum Debate? Newspaper and Government Representations of Asylum Seekers. Media International Australia, 109, 71–92. Retrieved October 28, 2018, from http://www.uws.edu.au/__data/assets/pdf_file/0010/26956/A17.pdf. Syal, R. (2014, October 26). British Towns Being “Swamped” by Immigrants, Says Michael Fallon. The Guardian [Online]. Retrieved January 19, 2019, from https://www.theguardian.com/uk-news/2014/oct/26/british-towns-swamped-immigrants-michael-fallon-eu.